Koch, South Sudan – Cradles and baskets balanced on their heads, thousands of women and children streamed in from the bush to two outposts in the swamps of Koch county in Unity state, the heart of South Sudan’s civil war. In August, South Sudan’s President Salva Kiir, an ethnic Dinka, and his rival, former vice president Riek Machar, a Nuer, signed a peace agreement to end what is now 21 months of fighting. Tens of thousands have been killed in South Sudan’s civil war, which largely pits Dinka against Nuer, and more than two million have been displaced, according to the UN. The convoy visited Koch town, held by the government, and Bauw village in rebel-controlled territory. Though South Sudan’s war is largely between Dinka and Nuer soldiers, in Unity, the fighting mostly involves different clans from within the broader Nuer community against one another, particularly in recent months. Altogether, more than 20,000 civilians – mostly women and children – received a combined 217 metric tonnes of food during the aid delivery, according to WFP, which led the relief effort with UNICEF and other agencies. “People were going to collect water lilies [to eat], looking for fish,” she told Al Jazeera. 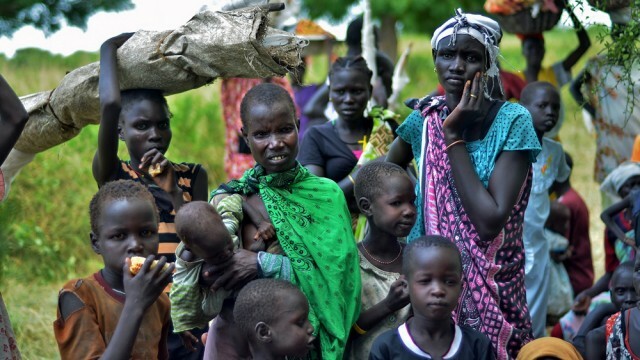 “What we saw was a situation that was very bad, but not quite as bad in terms of nutritional status than had been reported, so that is actually good news,” said Jonathan Veitch, UNICEF representative for South Sudan. “When you see the flights coming in, it means there is peace,” she said. Yet, continued fighting belies such optimism. While South Sudan’s leaders have claimed they are committed to the peace deal, commanders in Koch blamed each other for clashes and cattle raids that have taken place in the county since it was signed. “The government doesn’t want peace, they signed the paper, but they don’t follow it,” said George Gatloy, an opposition spokesman in Bauw. “I heard that the peace [treaty] was signed, but we are still hearing the sound of guns,” said one woman in Koch town who requested anonymity because she was afraid of nearby troops. “If there is peace and it lasts, then more help can come to you and your people,” Phee told rebel leaders in Bauw, flanked by aid officials. “[The soldiers] come every day [from town], and when they meet with the people who are in the forest they will start fighting,” she said. Joyce Luma, WFP’s South Sudan director, said there were concerns that civilians might be attacked after the aid workers leave. In July, government soldiers in Unity were accused of attacking and stealing relief supplies from a village after an aid delivery. The post Displaced and hungry after South Sudan’s peace deal appeared first on African Media Agency.